Earlier today Stephen A. Smith stated on ESPN First Take that LeBron James will meet with seven teams this summer. One of these teams are the Boston Celtics, a franchise LeBron has routinely terrorized in his distinguished career. The end of LeBron James’s tenure in Cleveland is drawing closer by the day. It is widely speculated that after the conclusion of the NBA Finals this year LeBron will join a new team to finish out his career. The most widely speculated belief is that he will make his way to the Hollywood Hills of Los Angeles. There he can work under Magic Johnson as a member of one of the league’s most historic franchises. He’d be able to pursue his post-NBA career business endeavors while attracting other stars to LA to continue chasing rings. The Philadelphia 76ers are another team that have a good shot at employing the king’s services. While the Lakers are situated in the Western Conference among the likes of the Houston Rockets and Golden State Warriors, the 76ers remain in the East with fewer powerhouse teams to threaten LeBron in the playoffs. He is known to be a big fan of ‘the process’, and is close with rookie Ben Simmons. He see’s a lot of himself in the self-proclaimed ‘prince’ of the league. James even believes Simmons has a chance to be better than him. With LeBron at the helm and so much young talent behind him, he could make a strong run at the title during his final twilight years in the NBA. 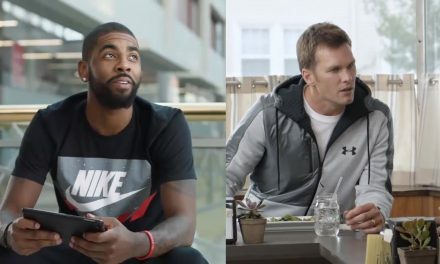 To be clear- the chances of Boston actually signing LeBron are slim to none. However, Danny Ainge having a chance to sit down with James and make his case is a thrilling opportunity. Financially it would be a very difficult situation to work out. 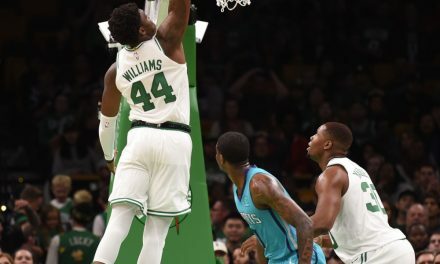 The Celtics are already set to breach the luxury tax for the 2019 season, and currently have two players on max contracts. The team is set to owe Kyrie Irving, Gordon Hayward, and Al Horford $76 million combined next season. Boston will be $15 million over the cap limit next year, even if they decide to re-sign Smart. In order for a LeBron signing to be feasible, the team would have to re-allocate integral pieces on the bench. Even if LeBron agrees to take a pay cut, Boston would likely need to shed one of their three major contracts. Meaning either Horford, Irving, or Hayward would have to be moved. Danny Ainge and the Celtics management group would have to be very creative to make such a contract work financially. It is not impossible, but it is unlikely. Would Signing LeBron be Worth It? LeBron James is still the most dominant player in the game today. He is 33 years old and has been in the league for 15 years. In 2018 he averaged some of the best numbers of his career with 27.5 points, 9.1 assists, and 8.6 rebounds per game. He has three championship rings, three finals MVPs, four MVPs (finalist for MVP this season), and is a 14-time All-Star. The debate has already been going on for years about whether or not he is the greatest to ever play the game. Adding LeBron James to a team that was one win away from the NBA Finals in a season without two of their All-Stars would undoubtedly make the Celtics front-runners for the championship. He would bring veteran leadership along with other-worldly talent to a roster already bursting at the seams with young potential. Championship aspirations in Boston would be a constant until the end of LeBron’s career. 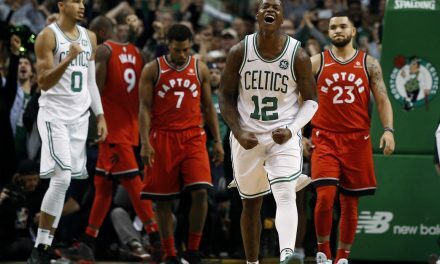 Given the bright future in store for two of Boston’s younger pieces in Jayson Tatum and Jaylen Brown, the Celtics have a unique opportunity to pull off a huge signing and still be set up for long-term success. 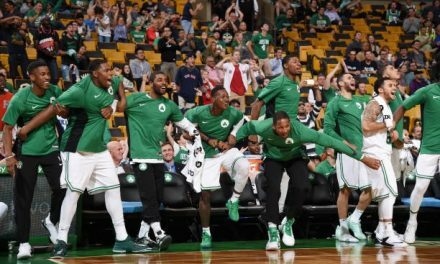 Add in the draft pick stockpile the team has built, and Boston could find themselves competing for championships long after LeBron retires. 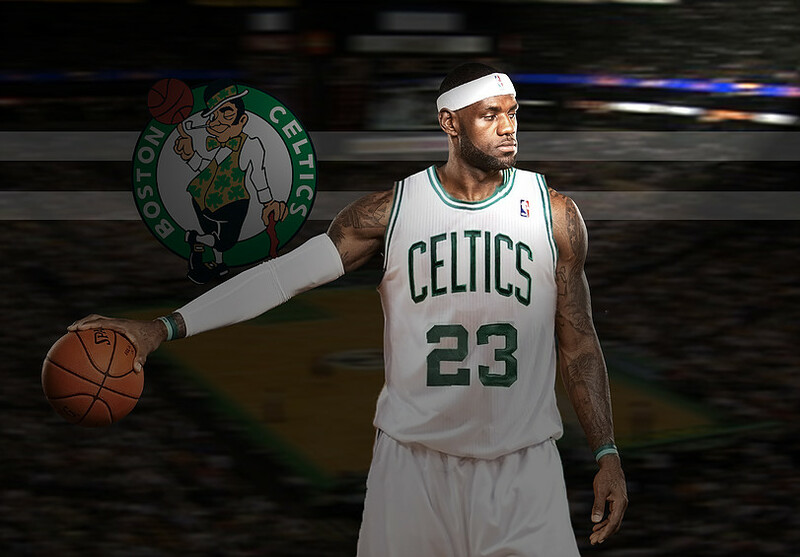 Odds are LeBron will not sign with the Celtics this summer. It is a complex situation financially, and no one knows how much interest James has in joining the team. That being said, in the NBA anything is possible. 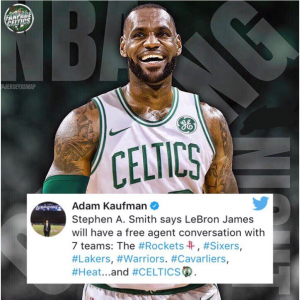 Just getting an opportunity to meet with LeBron is a big step in pulling off what would be the greatest free agency signing the city of Boston has ever seen. Buckle up Celtics fans, this summer is going to be a wild one.